Hydroacoustic mobile surveys with boat-mounted transducers provide high sampling coverage that is difficult or impossible to achieve with other gear types. Gear avoidance is generally negligible, nor does it affect fish health or the environment in which they are being monitored. It is a survey method well suited for the assessment of limnetic fish populations. The ability of acoustics to identify fish species is, however, limited and depends on differences in size, spatiotemporal separation, or a differential frequency response. If multiple species are present that do not separate in these characteristics, other information, such as netting data, needs to be gathered to apportion acoustic abundance estimates by species. The two principal analysis methods for calculating fish densities from mobile acoustic data are target tracking and echo integration. Target tracking techniques are the preferred method when fish are distributed as individuals in the water column, such that the echoes from individual fish are easily resolved. Target tracking methods provide information on individual fish, including acoustic size (which is related to physical size), position and relative velocity. When fish aggregate in tight schools, the echo returns often overlap. In this situation echo integration provides more robust estimates of fish density. Echo integration is a well-established fish quantification technique that is based on the concept that the total amount of echo energy is proportional to the density of targets in the ensonified volume of water. 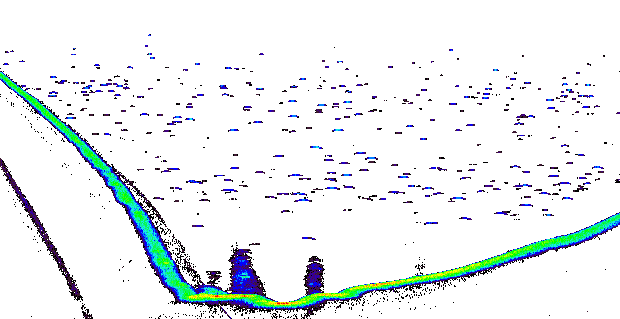 Down-looking echogram of data collected in a mobile survey in J. Strom Thurmond Reservoir on the Savannah River, Georgia. The layer of small fish above the thermocline (here approximately the top quarter of the water column) are mostly threadfin shad. The layer of medium-sized fish below the thermocline is mostly blueback herring. The few individual large fish distributed between the layers and among the blueback herring are most likely striped bass. 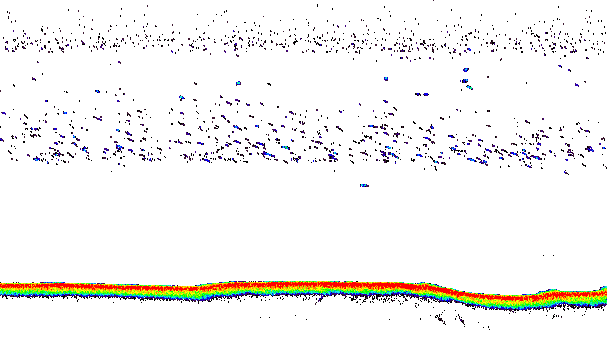 Down-looking echogram of data collected in a mobile acoustic survey conducted by the Confederated Tribes of Warm Springs, in Lake Billy Chinook, Oregon. Most of the fish seen in this echogram are kokanee. The echo traces of individual fish are well resolved and can therefore be analyzed with fish tracking. 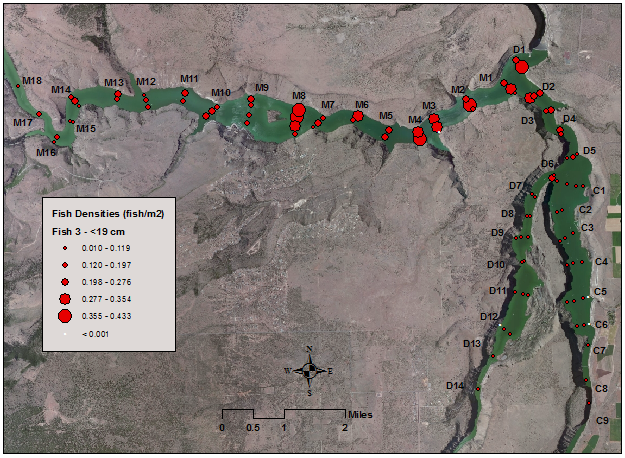 Aside from providing fish population estimates, the data collected in mobile acoustic surveys can be further analyzed for spatial patterns, as shown here with a map of the geographic distribution of fish of a certain size class and a tabulated vertical cross-section, which shows how the fish are distributed along one of the arms of the reservoir by 10 m depth intervals. The geographic distribution of fish in the size category of 3 - < 19 cm, based on mobile acoustic survey data collected in Lake Billy Chinook, Oregon.